Where to Buy Ramik Bars, Ramik Bars 4 x 16 oz Blox Box - $16.95 for Sale with Fast Free Shipping! 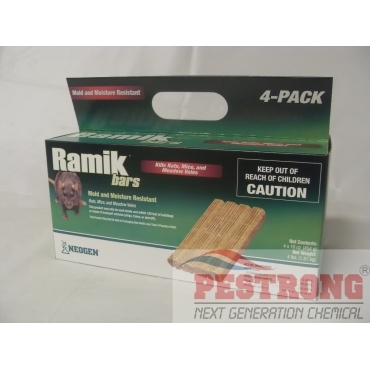 Ramik Bars 4 x 16 oz Blox Box are manufactured utilizing a special proprietary extrusion process, where all the bait ingredients are fully blended, bonded and then shaped into weather-proof bait bars. A small amount of edible wax is added to allow uniform sized bars to be formed. This product may only be used inside and within 100 feet of buildings or inside of transport vehicles (ships, trains, or aircraft). Each 16 oz (1 lb) bar can be used whole, or easily broken into 4 oz pieces. Works great. Rodent activity dropped within a day. This works very fast.